I am going to share with you a portion of a article by Rusty Hunt, the new National Grange Membership/Leadership Director. Rusty writes “We should not assume that people know about the Grange; We should not assume that everyone doesn’t want to join because they don’t ask. We should not assume someone is too busy to join the Grange. We should not assume anything. In my own case, I can tell you that I didn’t need to be asked. I was a good “Juvenile” member. I couldn’t wait to join the “big” Grange. We both met on Friday night – the kids in the lower hall and the adults in the upper hall. As soon as I was old enough, I joined the “big” Grange. In case you think I misspoke when I joined it was “Juvenile” and as kids we said “big” Grange. I know this is not the norm. We have to go out an ask our relatives, friends and neighbors to join. At our School Of Instructions, our State Master said we have 3668 members in the State of Connecticut. I would estimate that 95% of them were asked by someone to join. 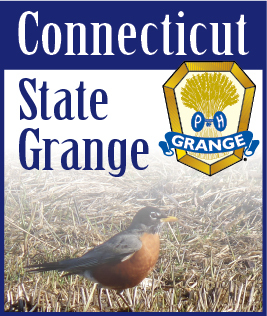 If you and I and the 3666 other members in Connecticut are enjoying the Grange, why shouldn’t we share our experiences with others. So get out there asking. You might be pleasantly surprised.